…on any food product that displays the Halal seal. You kn ow – that little seal that lets Muslims know this product observes the standards of their religion – just like the Kosher seal on foods for the Jewish community. 1. These Halal identified foods are taxed differently than other foods and those ‘taxes’ help fund terrorist activities. 2. The Halal seal on food products is somehow a sign that Islamic Laws are being carried out in Australia. When pressed about the seals displayed on Kosher foods, Ms. Banister was quick to point out that Kosher food was just fine because Jews follow Christ.- – you know – because Jewish people share the same religious beliefs as Christians. 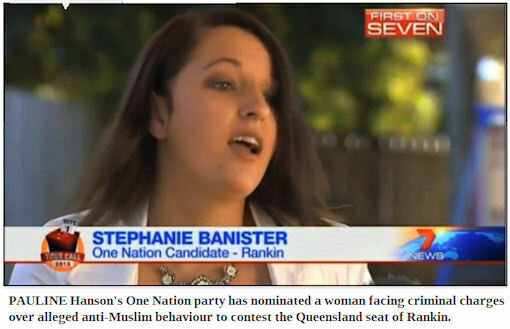 In true Sarah Palin fashion, Ms. Banister mistakenly refers to the Halal as the Haram (did she not read her own stickers? ), trots out both her small children (and family dog) and would rather we skip over the fact she is about to go to court to be tried for her criminal activities. Click either link at the top of this post to get the full story and see the video of her ridiculous interview. I swear you’ll think Sarah has a twin! Get out the popcorn! I promise you won’t be disappointed! I’m betting Hanson and cohorts will be pushing Banister to learn more about politics and world events, much like McCain tried to do with Sarah. Will be fun to watch just to see if she ever emerges again as a viable candidate. For now, however, it’s comforting to know Australia has averted the train wreck. As a side note, I want to make it perfectly clear to my American half what this political party represents and why I referred to it was the original Tea Party. Pauline Hanson, years ago and long before it was popular to distrust the Muslim culture in Australia, decided white people were becoming overshadowed by Aboriginals. This sub-culture felt it wad not right for the taxes paid by working class whites to pay for health care, community service or building infrastructure for any Aboriginals. One Nation was founded on the belief that white people are more entitled to live on Australian land than the race that lived here for thousands of years prior to it’s discovery by white explorers because Aboriginals lived off the land while white Brits built buildings and erected telephone poles.